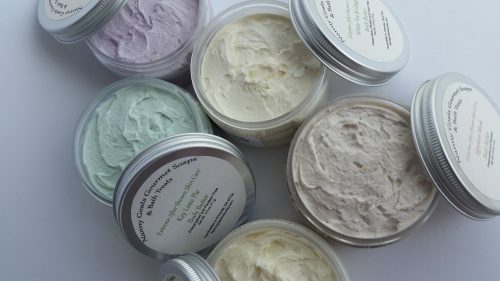 Short Product Description: Designed as an extreme moisture, after shower body butter. Feel free to use it as a hand cream but why not give your body an all over treat rather than just your hands? Triple whipped and silky soft made using the best of ingredients. 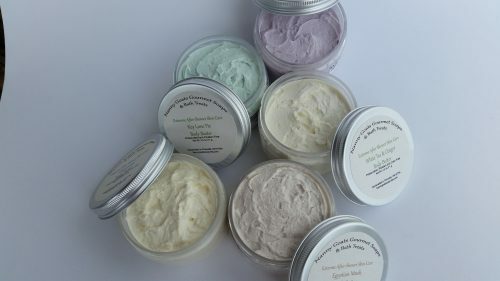 This is a true body butter made without any liquids which makes it thick, rich, fluffy and creamy due to whipping it for nearly an hour. It glides on smooth as can be leaving your skin dewy fresh, soft and incredible feeling. Packed with a multitude of vitamins and minerals that rejuvenate and nourish your skin while giving it a chance to fight the elements. All are Paraben and preservative free, some are even color free however, you can be assured that the colorants used are very minimal amounts.